Hey all! Long time no update! My baby is almost 8 months old (already!). Last weekend we had a family photo session at the pumpkin patch. Our photographer is a member of the regional babywearing group so a bunch of us met there and she took photos with us wearing our little ones and breastfeeding. Bax is a happy go getter who thinks he should be able to walk already. He has one bottom tooth and another on the way, and he babbles constantly so we’ve been joking that he is Sunny Baudelaire. He loves animals and Bup and daddy, but lately I am his one true love, and if I’m home, I had better be holding him. In other news, work is crazy and stressful as we try to get a new building. Trying to stay balanced has been challenging and my house is therefore a mess. But that’s ok.
We are cloth diapering with this baby and I am getting a little obsessed with how cute they are. But also a bit more laundry. Any of you cd’ing? What’s your favorite? And babywearing? How do you like to carry? I WANT to wrap, but I have no luck back wrapping at all. 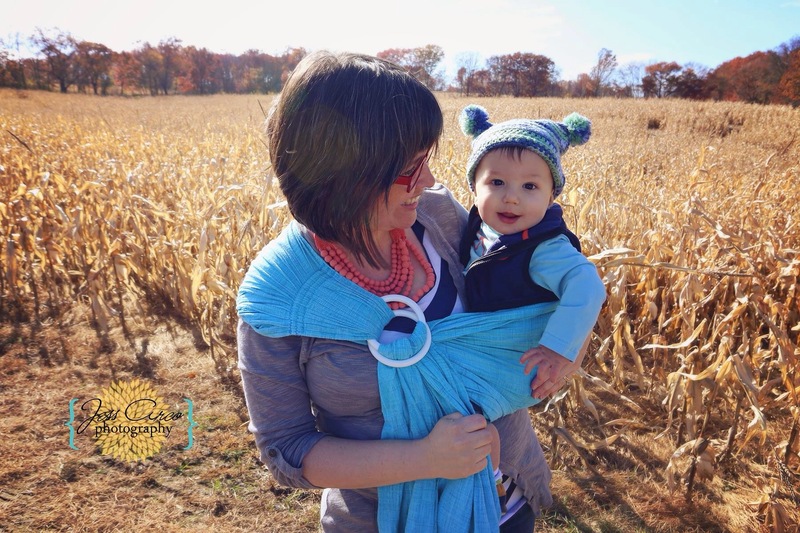 So we like the ergo and ring slings. This entry was posted in Uncategorized on October 24, 2014 by bookwormmommy2013. Adorable! Already 8 months? Wow…. What a cutie! I totally can’t believe our guys are that old already. We’ve been using the ergo and I really like it. I’ve only done the front carry but want to try the back soon. I really wanted to babywear but those first weeks I was too scared, then I was too upset with them to want them strapped to my body. Now they’re getting pretty heavy to carry both. Maybe I’ll get to babywear if I have a singleton in the future.